Remember party games? You know, you’d grab a bunch of buddies, order some pizza and spend the night working out all of your pent up issues in a virtual arena? Well, our friends at Chainsawesome Games also seem to have fond memories of that bygone gaming era, which has inspired Knight Squad, an eight-player experiment in medieval chaos. 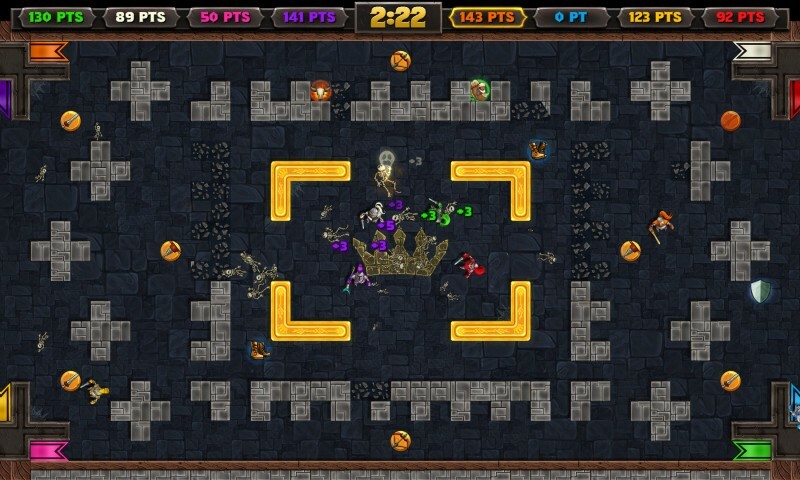 Knight Squad‘s most attractive feature is the sheer amount of gameplay modes available to players. They’ve got your basics covered—deathmatch and capture the flag are available as team or free-for-all game modes—but it also throws a lot of interesting challenges into the mix. I liked Gladiator, which is essentially a free-for-all king-of-the-hill match, as well as Crystal Defense, which tasks players with trying to mine the opposing team’s crystal stash while protecting their own. Character selection also has enough variation to ensure favorites among a given group of friends. While each knight has the same set of attacks and defenses, their unique character designs and victory animations inject them with just enough personality to set them apart from one another. I always find myself wishing for each character to have some kind of special ability in games like these, but that actually might have thrown the game out of balance. Putting everyone on equal footing as far as combat goes fits better with Knight Squad’s chaotic gameplay. It’s precisely that gameplay that makes Knight Squad a blast to play with others. Running around on Bomberman-esque levels and stabbing everything that gets in your way offers up some quality retro gameplay for multiplayer fans. While each knight starts off the match with their trusty broadsword, various powerups like shields, speed boots and the occasional laser gun pop up on the board which can make matches quickly devolve into who gets the mini-gun first—which is not necessarily a bad thing. It’s just as much fun to kill your opponents in a contest for heavy weaponry as it is to complete each game mode objective. On the critical side, there are times when Knight Squad’s controls get a little sluggish. It’s a reflex-intensive game, so it’s important that the controls are snappy enough to make every gouge count. While it’s a little better when playing with a controller, the player’s different attacks appear to move pretty slowly, making it hard to accurately time each lunge and gunshot. This also makes it difficult to play defensively, since it’s tough to maneuver one’s way out of a tight spot. I also found myself wishing that the avatars were a little bit bigger during gameplay. Despite the decent variety of selectable knights, when they’re all running around onscreen it’s pretty easy to get them mixed up with one another. 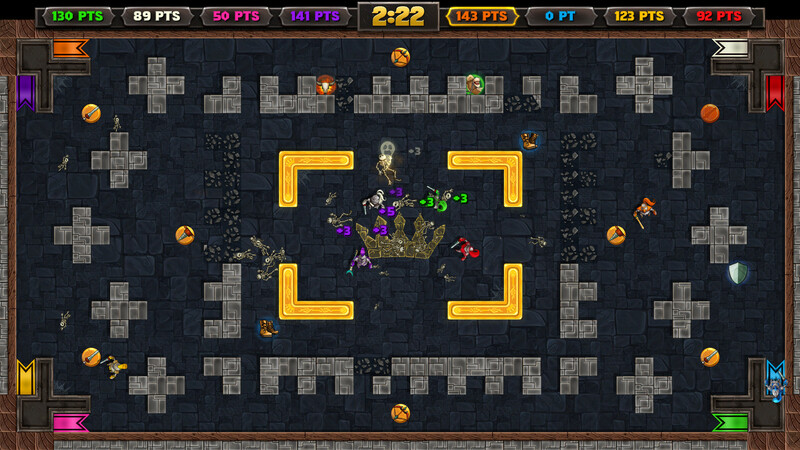 Knight Squad is also unabashedly multiplayer, which means solo play is very much an afterthought. Single player games are limited to the deathmatch modes, which are played with a series of bots. None of the team game modes are available with just one player, which means Knight Squad pretty much requires multiplayer gameplay in order to take full advantage of the game’s variety. Again, multiplayer is something that Knight Squad does really well, but as a social introvert, I always like my games to have some kind of valuable single player modes as well. At fifteen bucks, it’s best to make sure you’ve got a tight posse of pals who are willing to slice and dice with you. Gamers who get misty-eyed for old school party games will definitely want to check out Knight Squad. It’s got a great balance of unique characters, diverse gameplay modes and overall goofiness which will please the more social members of the gaming community.